Let’s Paint Pokeberry Poison! – Let's Paint Nature! 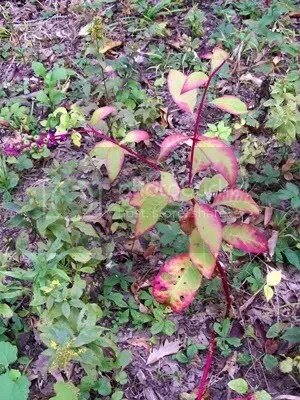 On the Little Red Schoolhouse trail, I found Pokeberry! 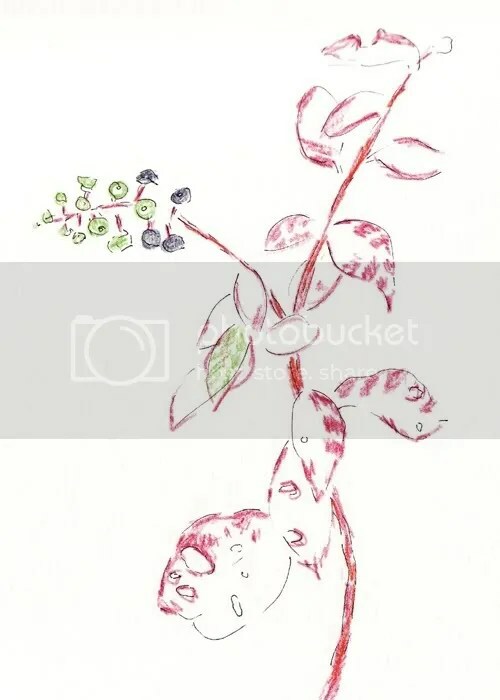 Pokeberry is a weed that has a hypnotic bright fuchsia stem and beautiful berries, but do note that Pokeberry = poison to mammals so do not eat!!! 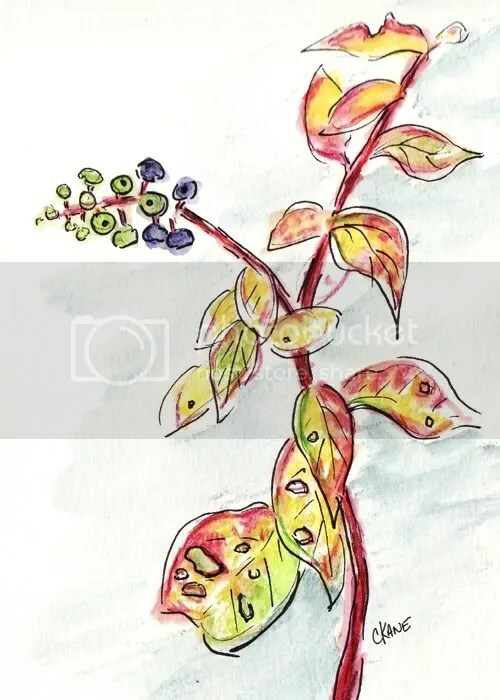 The toxins found in the leaves, stem and seeds can cause death…which is why our painting will be called, Pokeberry Poison. It may be hard to see against the background, but our pokeberry plant has intriguing autumn leaves, holes and all. Step 1: Make a sketch with 01 Black Micron Pen. Be loose, keep your lines open, don’t enclose every shape…it just looks better and makes your painting lighter. Step 2: I’m using Derwent Inktense Pencils, a permanent watercolor pigment in the form of pencils, activated by water. Today we only need a few colors; apple green, deep indigo, violet, fuchsia, sherbet lemon, and sun yellow. Remember when you were a kid and played with those painting coloring books, where all you needed was a cheap brush and some water? This is similar, but you have to make the picture now. Hot dog! How much fun! Step 3: Filling in with some more color, remember to leave some white space for breathing room. The Pokeberry plant was really intense with color, so don’t skimp out on pure bright pigment for this painting. Most of the time using such colors together would make you nauseous, but for this time of year it is fitting. Finally, the fun part! Add water with a clean brush. Make sure to clean your brush every time you move to the next color, so you don’t create mud. Keep your colors fresh! 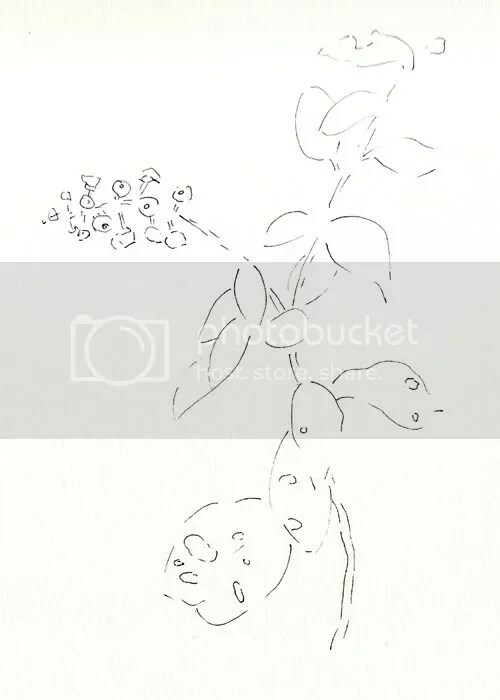 I also took a 05 Black Micron pen and made some more defining lines around some leaves and berries. I also want to talk about the importance of bug holes. Bug holes keeps it real. Nobody is perfect and our imperfections makes us unique. Perfect people are scary because you know something is not right…nobody is perfect. An imperfection tells a story and everybody has an interesting story. Don’t leave imperfections out of your painting! 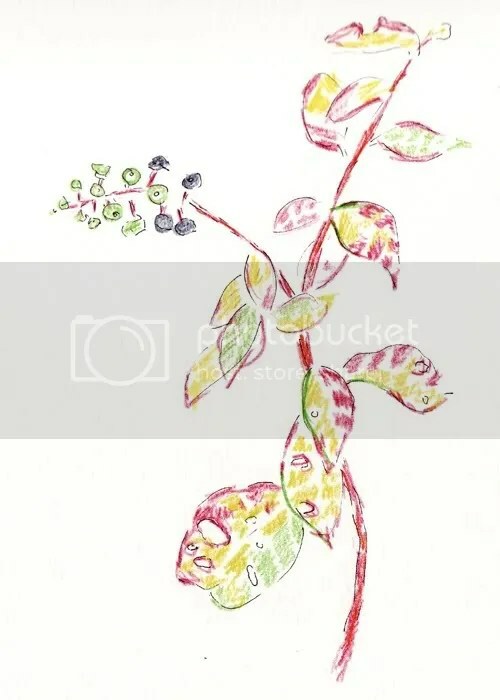 This original watercolor painting, Pokeberry Poison is 4.5×6.5 and is matted (antique white) to fit a 8×10 frame. It is available for $40 plus free shipping. Click here to purchase. You do not need a pay-pal account. I hope you enjoyed this demonstration! That looks like polk salat. We have a polk salat plant that’s literally at least as tall as our house! Neither of us have ever seen one so huge. As far as the colors making people nauseous–I resemble that remark! The more obnoxiously bright, the better! Lana: lol, bright is good! I hear in the south they make poke salad by boiling the leaves three times to remove toxins. Have you seen poke salad? Or tried it? Dangerous!